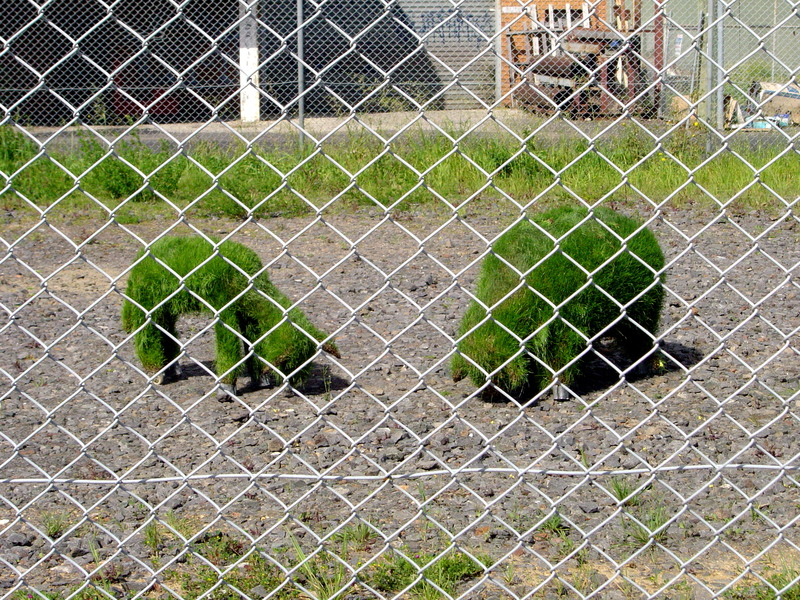 In a patch of grey blue gravel on a vacant lot beside the train tracks two sheep formed of growing green grass graze. If we are what we eat then sheep are grass. The grass and weeds along the fence-line frame this surreal sight. It is Candy Stevens’s “Landscape Gardeners” part of MoreArts. Following up on my previous post, Paradigm Shift in Public Art, the annual MoreArts exhibition is a series of installations along in Moreland along the Upfield train-line between Jewell Station and Gowrie Station. There is a lot of wasteland that once was part of the light industrial area beside the tracks. Many of the installations are site-specific. Tobias Hengeveld “Lookin’ Back Down the Line” used Brunswick stations old station office and ticket booth for the installation site. At the now un-staffed station the strains of American folk music echoed inside the disused station; from the ticket booth you could see warm orange light defused through a screen. Many of the installations took advantage of the ubiquitous chain-link fences around these disused sites. Sansern (Zood) Rianthong’s “The Fence” used plastic straws to draw images on the fence. The chain-link fences also provided some security for the work. 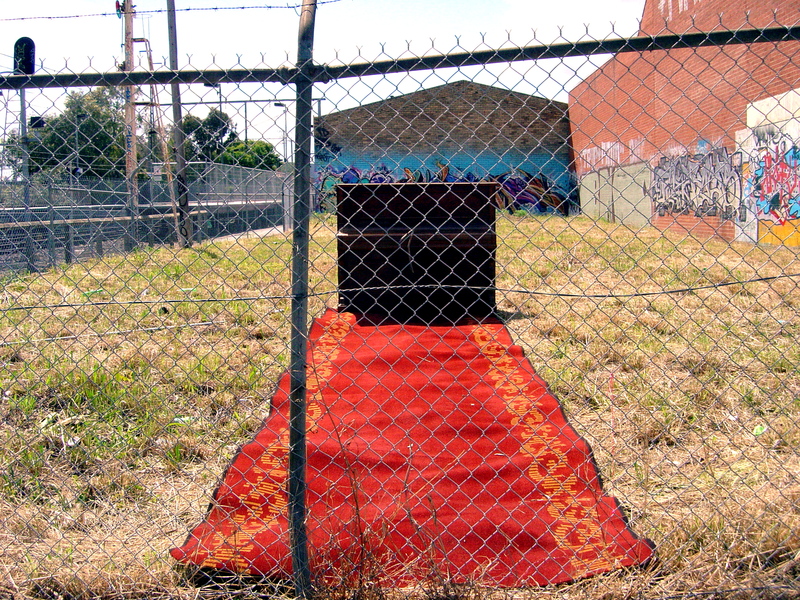 Michelle Robinson’s “Fugitive Piano” looked somewhat clichéd and by the time I photographed it the piano stool had become fugitive – so much for the effectiveness of the chain-link fence. ArtLand at RMIT’s Brunswick campus was a geographically logical end for my ride to see MoreArts and many of RMIT’s students had wanted to participate (60 of them). But the result was poor quality art plonked everywhere around the campus with little consideration for the location; lots of stuff hanging from trees. 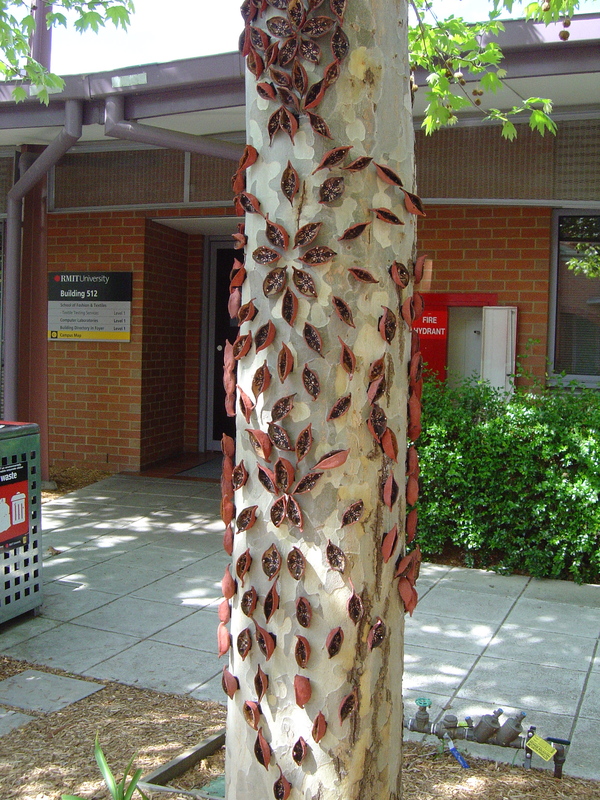 Amongst this there were some gems, like Sharmiza Abu Hassan’s “Metamorphosis” where locally collected Kurrajong seedpods were painted with a Malay motif and attached in a pattern using Velcro strips to the trunk of a tree. Ricky Bhutta’s “Brunswick’s finest” had images on t-shirts that referred to the factories and graffiti opposite the carpark. The most convenient way to see the exhibition is to walk or ride a bicycle along the bike track that runs parallel to the train tracks. And there were plenty of people walking and riding the trail to see the exhibition although many missed seeing all of the installations in MoreArt – I spoke to one couple who had only seen two installations between Brunswick and Moreland. There are a number of bicycle tours and walking tours of the exhibition. MoreArt is an interesting exhibition for many reasons, one being because it is also in competition with the huge amount of street art on the walls along the railway line (contemporary art installations vs street art). 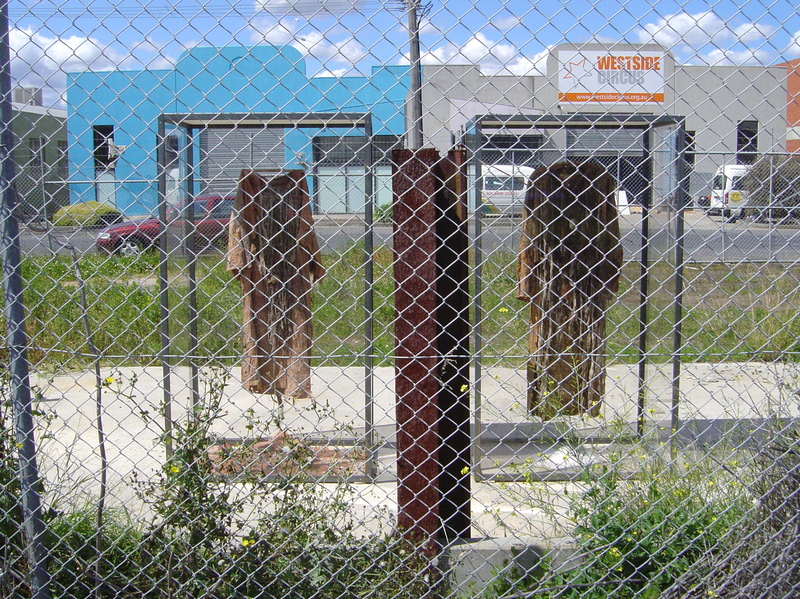 This entry was posted on Tuesday, October 4th, 2011 at 9:45 PM	and tagged with bicycle path, Brunswick, Coburg, installation art, MoreArts, Moreland, RMIT and posted in Public Sculpture. You can follow any responses to this entry through the RSS 2.0 feed.